I usually don’t talk about stuff like this on my show, but I really want to thank everyone who is supporting me. Here are the values I stand for. I stand for honesty, equality, kindness, compassion, treating people the way you’d want to be treated and helping those in need. To me, those are traditional values. That’s what I stand for. That is grace under fire. I remember when the episode of the sitcom Ellen was aired in the UK. Channel 4 hosted a party and invited DeGeneres. She was visibly moved, and said she could not believe that it was happening considering how it had played in the States. The world was a different one in 1997, and there were far less LGBT role models. And Ellen was an enormously successful show, with almost 11 million US viewers per episode in the 1996-1997 season. It was a brave move. The Christian Right mobilised against her, of course. Ellen got a little too caught up in gay issues in response, and lost its humour. But that did not stop DeGeneres. 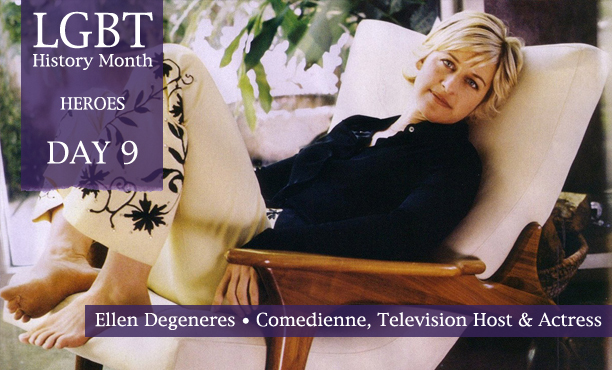 The Ellen DeGeneres Show launched in 2003, and in 2005 she presented the 79th Academy Awards. DeGeneres announced her engagement to Portia de Rossi on The Ellen DeGeneres Show in 2008, and they were married in California before the passing of Proposition 8. She’s an active member of Parents & Friends of Lesbians and Gays (PFLAG) and spokesperson for the Human Rights Campaign’s Coming Out Project. And she’s enormously likable. She presents a human face to LGBT issues, and does not talk down to her audience or tell them what to think. As witnessed in her reaction to the aggressive bullying of One Million Moms, she has always been witty and considered. She is the grown-up against these wayward children.